For our customers who need to perform periodic testing or short term testing, Phenix Technologies has added to our product line a variety of test equipment rentals and testing services that can be performed either on-site or at our factory in Accident, Maryland. Phenix Technologies is committed to manufacturing and offering a wide range of testing solutions and be your one and only source for High Voltage, High Current, and High Power Test Systems and Components! Partial Discharge measurement according to IEC 60270 can be performed in single- and three-phase applications with the model PD2U and PD3U respectively. Phenix Technologies can provide an entire PD measuring system including the coupling quadrupole, preamplifier, measuring device, calibrator and coupling capacitor C = 250…1000 pF, U = 100…400 kV. For measurements in noisy environments, it is possible to exclude the disturbance signals from the measurement with an antenna used in conjunction with the noise gating function incorporated in the measuring device. The RIV meter is used for the measurement of ‘Radio Influence Voltage’ according to NEMA 107-1987 and other relevant standards (ANSI 63-2-1996, VDE 876, DIN EN 55016-1-1). In former years, the RIV-meter was the predominant instrument for measuring Radio Interference (RI) from electric power. Although RIV measurements were abandoned by many standards in recent years, this measurement technique is still relevant today to distinguish the influence of High Voltage equipment on communications lines. Acceptance tests and routine test are often still performed according to older IEC or IEEE standards requiring the measurement of radio influence voltage. The indicator for insulation failures is a high frequency disturbance voltage in “μV” in superposition with the line-voltage-signal. It is not possible to recalculate the PD-level from the RIV value directly, because some uncertainty in the internal detector can occur. With a measuring impedance of R = 60 (150) Ohm the RIV-value of 1 μV is approximately equivalent to a PD-level of q = 2.62 (1.05) pC. The instrument has a bandwidth of 9 kHz and a tunable center frequency of 10 kHz-10 MHz. For calibrating purposes, Phenix also provides the CAL3A Calibrator with a selectable frequency of 600-1350 kHz in 50 kHz per step and an output voltage in the range from 10 μV to 10 mV in 1-2-5 steps. The dielectric losses in electrical insulation are measured with a tan δ-bridge. 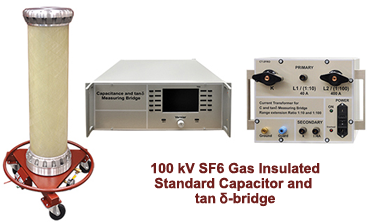 A tan δ-bridge is a highly sensitive measuring instrument, capable of measuring losses in insulation down to 10-5 times the apparent power demand during AC voltage excitation. Such small losses can only be measured by comparison against an SF6 gas insulated standard capacitor through a bridge circuit. To measure the losses of large capacitive loads requiring high excitation currents, Phenix Technologies also provides a current divider. The standard field use equipment is rated for 100 kVrms. At Phenix Technologies’ headquarters in Accident, MD, USA, C tan δ measurements can be made up to 750 kVrms. This high voltage test set can be used to apply an AC high voltage for testing capacitive loads. Therefore, it is excellent for testing insulators, capacitors, overhead lines, high voltage switches, cables, motors, and generators. This test set consists of a control panel, variable voltage source and high voltage reactor with three different high voltage taps (25, 40 and 50 kV). This unit is rated for 500 kVAr at 50 Hz, and 415 kVAR at 60 Hz, with a duty cycle of 5 minutes ON and 15 minutes OFF. E.g., it is possible to test a cable at 50 kV and 60 Hz up to 6 miles (10 km) length. 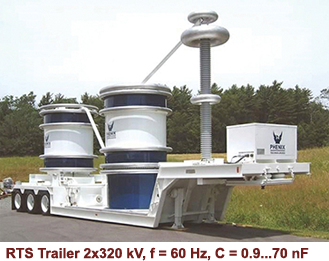 This trailer mounted test set is rated for 16 MVAr power up to 225 kV (71 A). E.g., it is possible to test a cable at 225 kV with a capacitance of 2.0 μF at a frequency of 25 Hz. That equals a cable length of 10 miles (14 km). This mobile test set is a variable high voltage inductor. That means constant frequency, but the inductance can be adjusted to resonance. Each module can provide 320 kV and 4.2 A at 60 Hz; for a total output power rating of 2.7 MVA. In parallel module connection, it is possible to test a capacitive load C = 3.5…70 nF, up to 320 kV. In series module connection, it is possible to test a capacitive load C = 0.9…17.5 nF, up to 640 kV. The unit is rated for a duty cycle of 1 hour ON and 1 hour OFF. 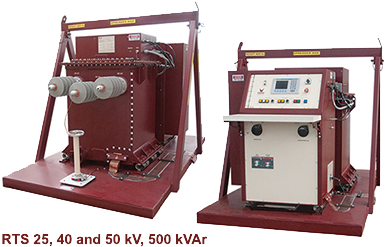 This capacitive high voltage load bank is specified for up to 300 kV and 28 MVAr capacitive power at 30 Hz. 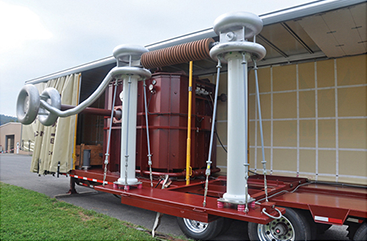 The main purpose is to simulate a load of a high voltage cable when testing high voltage reactors. It is also possible to simulate a high energy cable discharge test, as may be associated with DC or VLF AC testing of long high voltage cables. 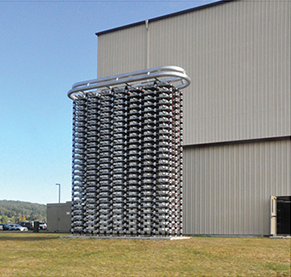 In addition to this large capacitive load bank, Phenix Technologies is able to provide other high voltage capacitive loads for higher voltage ranges and lower capacitive values. E.g., C = 0.5…10 nF up to 1.2 MV. Phenix Technologies can provide a PD-free high voltage up to 750 kVAC at 50 or 60 Hz. 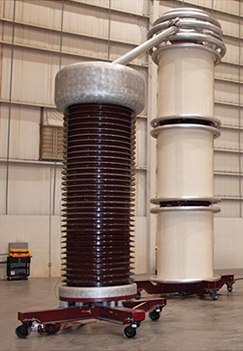 Phenix’s indoor high voltage test hall with a ceiling height of 70 ft (21 m) can easily handle large high voltage components up to 40 US tons (36 metric tons) in mass. The uncertainty for voltage measurements is less than 0.3%.